Lee Ann and David Berlet bike three times a week nine or 10 months of the year. The couple formerly ran together, but Lee Ann’s joint issues caused them to switch to bikes. The London couple, who are 58 and 61 years old respectively, feel the hour they spend riding is a physical and mental boost that they value. “We go hard and do about 20 kilometres in that hour,” says David. They love London’s paths that wind along the river, covering the city from east to west and north to south. According to Andrew Macpherson, manager of Environmental and Parks Planning for the City of London, there are 42 kilometres of pathway, most of which is off-street. St. Thomas couple Mark Fagan, 58, and Rachel Chandler, 53, are enthusiastic road cyclists, riding to work in London two or three times a week during the good weather months. They also participate in road cycling events, such as MS Bike. They have ridden in events or on vacations in England, Italy, Michigan, Colorado and Texas, as well as much of Ontario. They clocked 5,000 kilometres on their bikes in 2017. According to Fagan, they would like to ride to work more often but are discouraged by the danger. “Texting and distracted driving are huge problems. Having paved shoulders on the roads would solve a lot of the problem,” he explains. Both couples agree that along with the wellness benefits, having the shared activity is a boon to their respective relationships. Dr. Harry Prapevessis, director of the Exercise and Health Psychology Lab at Western University, agrees with Fagan and hopes that city planners will plan for enhanced road spaces for those who want to pursue the active transportation option that a bike gives them. “Europe has set the bar so high for what a cycling community looks like,” says Prapavessis, adding that the infrastructure there for biking is very advanced when compared to that of North American cities, which are focused on automobile transportation. 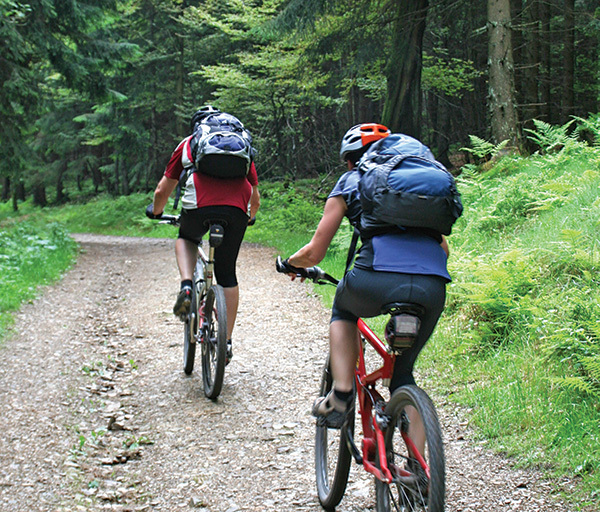 Besides casual and road cyclists, there are those who love the rough terrain they experience when doing the 20-kilometre bike trail around Fanshawe Lake. Others are road racing cyclists who crave competition. There is a different type of bike to enhance the experience no matter what style of cycling suits you. From fat bikes (those with wider tires for rough terrain) to road bikes for endurance riding to highbred bikes, which Sheri Laidlaw, owner of To Wheels, says are the most popular, there is the perfect ride for every cyclist. The Berlets favour the south branch of the path system – because it’s a less busy, quieter, scenic stretch – which runs from near their home downtown to the Meadow Lily area. According to Macpherson, “In Kiwanis Park, the addition of three bridges and 1.7km of pathway (2018) will link the park to the Thames Valley Parkway.” He adds that it’s due to open at the end of May. Planning is underway to extend the western and northern legs of the path, as well. This will give fitness seekers new areas to explore on their bikes because it’s good for mind, body and spirit. “Evidence shows that there are mental health benefits about moving your body in a nice environment while connecting with nature. You feel good that you’re outside in the sun and enjoying the vegetation,” says Prapavessis.